1 - Bascinet Helmet, helmet closed manually made ? ?of carbon steel pieneamente wearable, used the heavy cavalry in the Late Middle Ages (thickness to choose from: 1.2 mm, 2 mm). We propose a series knight helmets, helmets are a bascinet with visor. These particular models bascinet have a double visor and a bevor hinged on both sides via cinchie leather and buckles, and then disassembled. When the helmet is worn, face shields cover the entire face, the first visor has slits for the eyes, while the second peak of this ventilation holes. This design is ideal for combat but also for parades of medieval re-enactment. 2 - Bevor included in the helmet to protect the chin and throat. 3 - Cuirass, part of medieval armor to protect the chested and back, formed by the Breastplate and back armor. The armor is made on your measurements, specify when ordering (chest circumference at the level of the breast, total height and weight. 4 - Pauldron, Shoulder, to protect the shoulders, This piece of armor covers the shoulders, the shoulder straps are anchored to the cuirass by means of interlocking and leather straps. 5 - Medieval Full Arm Armor Consists of three parts: Vambrace (protection of the forearm), Couter with side wing (elbow protector), the Rerebrace (articulated more plates). Are articulated together by hinged plates, arched and fixed by rivets sliding. 6 - Articulated Gauntlets, medieval protective gloves to protect the hand and wrist. 8 - Medieval Combat Armor Sabatons, shoes steel articulated. the shoes are made of cold rolled steel. . Entirely made of steel and hand-crafted by artisans in Italy, with coietti leather to be worn. Made of steel and fully wearable handmade comes with support and wooden base. This exceptional reproduction of Medieval Knight Armor is crafted in the tradition of master craftsmen the Milanese who created the originals for knights fighters. This wearable articulated Medieval Knight Armor has a brushed steel finish, reproduction the model of the medieval armour originals that can be seen today in museum collections around the world. 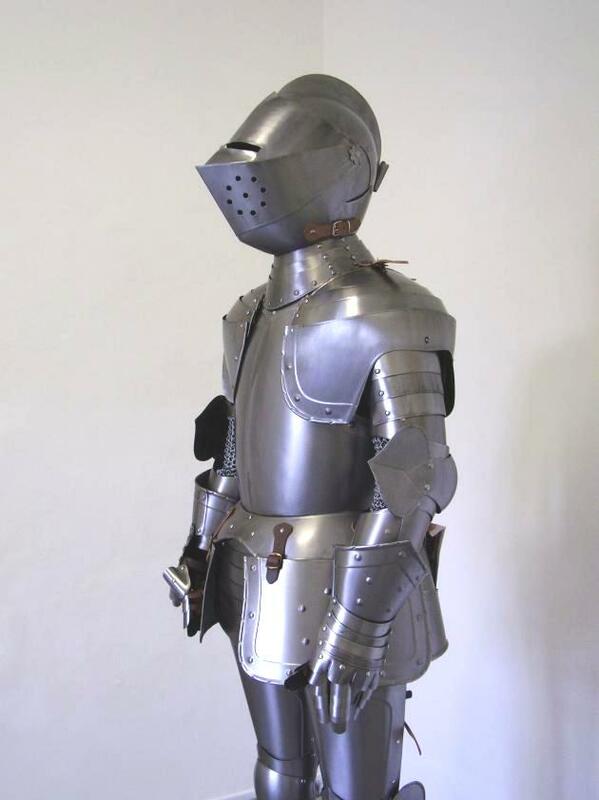 All of our reproductions of medieval armor and then also this Medieval Knight Armorr are faithful reproductions of historical medieval armor for combat, can be worn for special events, historical re-enactment to compose your armor ideal. Armor handcrafted, and fit various sizes, using leather straps with buckles external adjustable, can be custom made. They are armor forged by hand by steel plates with processes not modern, such as the fold and polishing, the thickness can be selected from the following measures: 16 ga -14 ga (1,2 - 1,5 - 2,0 mm). Size: 6-1/2 foot (185 x 85 x 43 cm) - weighs 77 lbs (35 kg). In the Middle Ages, there were two major schools of production of armor, where skilled craftsmen created armor for knights in combat, and they used in ceremonies. The first to make armor plate, it was the Italian craftsmen gunsmiths, over the centuries, suguirono German craftsmen who added decorations in relief. Observe the difference in detail between this armor produced in Italy and other manufactured elsewhere, there is no comparison. Made of steel, handmade wearable. Medieval knight Armor - Medieval Armour. - Material: 16 ga -14 ga (1,2 - 1,5 - 2,0 mm) steel. - Size: 6-1/2 foot (185 x 85 x 43 cm). - Weight: approx. 77 lbs (35 kg). Shipping time: 7 to 14 Days. The medieval armor during the Middle Ages and the Renaissance have undergone many changes, because in the Middle Ages the art of making medieval armor was highly developed, the various knights and nobles of the time had developed his own style in the armor, as if they participate in a competition well as military also style. And it is for this reason that in the section medieval armor is so large and full of different styles. This armor is produced in Italy, faithful to the ancient artisan tradition of Italian gunsmiths, from the Middle Ages that has been passed down from generation to generation and has come down to us. We are the only ones who have inherited the ability to produce armour high bill, from the point of view of functionality, ensuring maximum comfort and protection in combat, an outstanding product from the point of view of art and affordable, lowering the cost of intermediaries commeciali, with the ability to customize the medieval armor to the your measurements.